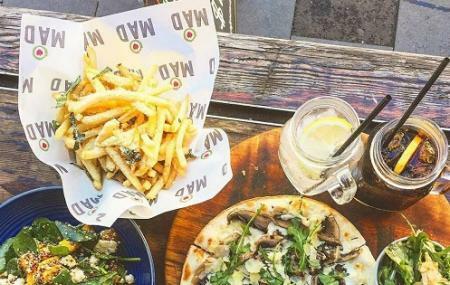 Find hotel near Mad Pizza E Bar, Bondi Be ..
Mad Pizza E Bar is a pizza restaurant located close to the Bondi Beach in Sydney. The restaurant is decorated with checked tablecloths and old film posters. Pizzas along with pitcher cocktails is a must when visiting this place. Some of the must try delicacies include Quattro and Amalfi pizza. To personalise your visit to the city, you can use an all-inclusive Bondi Beach trip planner for the same that will give detailed information about visiting the city. Hotels like Springfield Lodge, Ibis Sydney Darling Harbour, Russell Hotel In The Rocks and Waldorf Randwick Serviced Apartments will solve your problem of where to stay in Bondi Beach. Find out how to reach Bondi Beach to begin with. Plenty of wholesome Bondi Beach vacation packages are available to choose from, pick your today! Love this? Explore the entire list of places to visit in Bondi Beach before you plan your trip. Fancy a good night's sleep after a tiring day? Check out where to stay in Bondi Beach and book an accommodation of your choice. Kid-friendly, great pizza and drinks deals - we are regulars. Love this place! Lovely staff, quick service and delicious pizzas and I don’t even like pizza! Only complaint is that it gets too busy in the summer. This place is simply amazing. The food is delicious: a half-half option and a superthin crust makes the pizzas unique. Then the rocket salad.. Classic taste in it's simplicity, though spiced up with an extraordinary balsamic dressing. Great wines by the glass. The hostess and waiters know what they're doing, very professional though friendly and informal. The energetic staff, the wide variety of cocktails shaken by the bartender and the music are reasons you don't want to leave after dinner. MAD pizza is definitely not your ordinary pizza restaurant, make sure t pay a visit while in Bondi (Beach)! The most FABULOUS pizza I have EVER had, EVER! I am very well traveled, and let me tell you to come across such a neighbourhood gem in the heart of Bondi, where not only the product is a standout but to also have exceptional service whilst also listening to pumping music was truely a perfect Friday evening. Kudos to the beautiful manager and her team for looking after us so well. Cant wait to visit again.